A total of fifty-eight law enforcement officers have been killed on this date, April 7th, according to the Officer Down Memorial Page. It was a Friday in 1876, when Montgomery County, Texas Deputy Sheriff Abner B. Womack, Jr. was gunned down trying to arrest a horse thief. We know the suspect was arrested, but have no details of his punishment, if any. Exactly one year later, a second Texas law enforcement officer, Deputy Sheriff Gabriel Leander Pool, of Milam County, Texas became the second officer murdered on this date. He was shot down as he attempted to arrest a murder suspect. Thirty-seven of the officers killed on this date suffered death by gunfire. Eight of those were murdered in Alabama. Illinois and Texas each lost five officers on this date. The most recent officer to die from gunfire on April 7thwas Wade C. Barrett, Jr. who was with the DeKalb County, Georgia Police Department. He was murdered when he answered a disturbance call and was confronted by five robbery suspects. Although wearing a vest, one bullet entered an opening in Officer Barrett’s vest, striking his heart and killing him. We should never forget these and the many others who gave their lives for us. Take a few minutes. 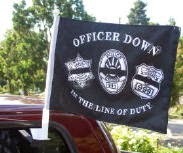 Visit the Officer Down Memorial Page. http://www.odmp.org/search/this_day_in_history/april/7. Reflect on each name you see there and consider the families they left behind.